The SVC-RS2 is an American made PVC vent cap, with screen, that keeps animals and debris out of HVAC and plumbing vents. This vent cap may be used to protect intake and exhaust vents, in addition to sump pump and drainage applications. The SVC-RS2 may be slipped over an existing 2″ pipe for use as a cover, permanently attached with a cement weld or securely held in place with the included fasteners. The patent pending SVC-RS2 vent cap with screen is ideally suited to protect PVC sump pump discharge lines and other two inch PVC pipe venting applications from unwanted entry from animals and debris. The SVC-RS2 features a durable PVC housing that may be easily installed over an existing 2″ PVC pipe measuring 2-3/8″ (outside diameter) with a slip/press fit, permanently attached by using a cement weld or attached with the included stainless steel mechanical fasteners for a secure but serviceable install. The American made 316 stainless steel screen utilized in this vent cap is of the same quality that we use in all of our vent screens, which ensures a long filtration life and superior resistance against corrosion in harsh environments such as drainage and vent pipes which discharge mildly acidic exhaust gases. The stainless steel screen used in the SVC-RS2 maintains an open area of 76% to ensure adequate flow of air, gas and water. Each opening in this screen measures .218″ x .218″, which is small enough to keep out smaller ground dwelling animals such as chipmunks (ground squirrels), mice, moles and snakes along with lawn debris such as leaves. The SVC-RS2 vent cap with screen also guards against larger animals such as birds, chipmunks, squirrels and other outdoor pests. Our 2″ SVC-IS2 vent cap may be utilized in those applications where insect protection is also required. 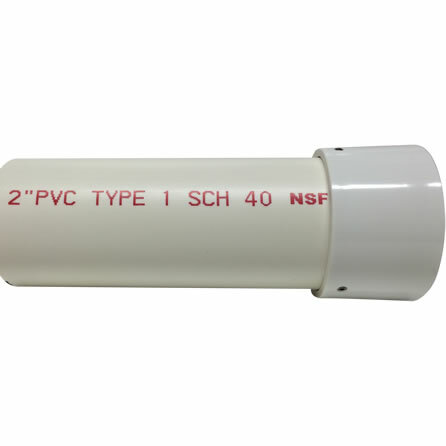 Please note that the SVC-RS2 vent pipe cap with screen is designed to install over and cover an existing 2″ PVC pipe termination that has an outside measurement of 2.375″. A smaller version of the SVC-RS2, to cover 1-1/2″ PVC pipes is available here. Installations into a 2″ hub or coupling should use our PVS-RS2 for rodent protection or PVS-IS2 for dual insect and rodent protection. The PVS-RS2 and PVS-IS2 also offer superior airflow for HVAC applications and are better suited for modern day high efficiency boilers, furnaces and hot water heaters. Each SVC-RS2 vent pipe cap we sell ships individually packaged, with installation instructions and includes a free hex wrench.